I had such a great weekend down in Florida for the Wine & Dine Half Marathon! 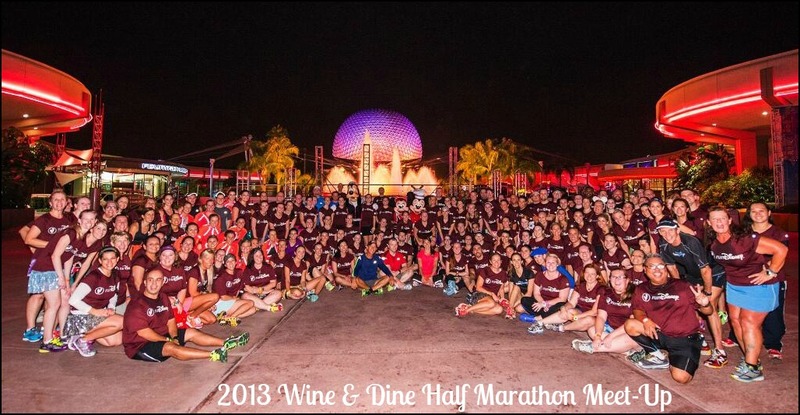 I can’t wait to tell you all about the race itself, but first up was the Wine & Dine Half Marathon Meet-Up on Thursday night! I was 1 of 125 people chosen to participate in this exclusive event (entry was on a first come first serve basis in response to a Disney Parks Blog post a few weeks beforehand). Participants checked in at Epcot around 7pm and received a runDisney shirt, a park ticket and a FastPass for Test Track. We had some free time in the park until we needed to meet up at 8:45pm to enter our special viewing area for Illuminations, Epcot’s nighttime fireworks show. Meet-up participants waiting for Illuminations. Jenn and I managed to snag a spot right upfront by the railing, so we had a great view! After the fireworks we headed over to the American Gardens Theatre where there was some light snacks including fruit, veggie platters, cookies and a sample from the Terra booth (vegan) at the Food & Wine Festival. Once we were all seated they started with a short presentation including a welcome from runDisney staff Darell Frye and Farron Kelley who gave away some runDisney prizes, including a few free race entries! 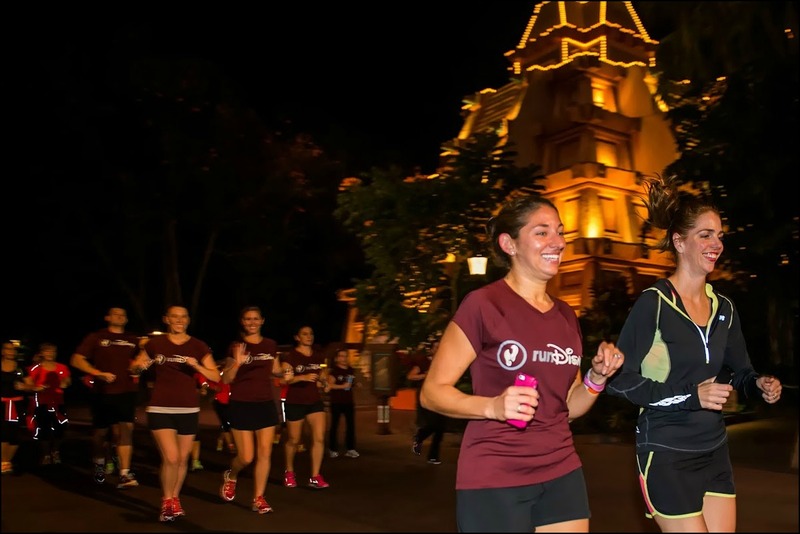 runDisney nutritionist Tara Gidus and official training consultant Jeff Galloway also came up and offered a few tips on running and fueling for a night race. 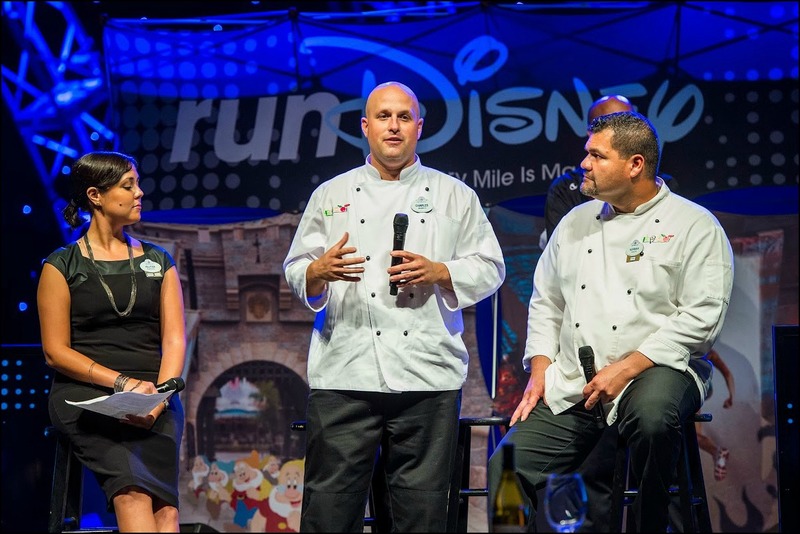 And since this was the Wine & Dine Half Marathon we got to hear from a few of the great chefs who worked on the Epcot Food & Wine Festival to share some information on the offerings around the festival! Lastly New Balance representatives came up to give a quick update on the partnership between New Balance and runDisney. 2013 was the first year New Balance offered a Disney themed sneaker available only at the runDisney event expos and they said the interest in the shoe completely took them by surprise (knowing Disney fans, I’m not surprised by it at all! ), and they’re looking forward to revealing the 2014 edition. New Balance had also invited a group of military (one from each branch) to participate in the Wine & Dine Half Marathon since the event was over Veteran’s Day weekend. 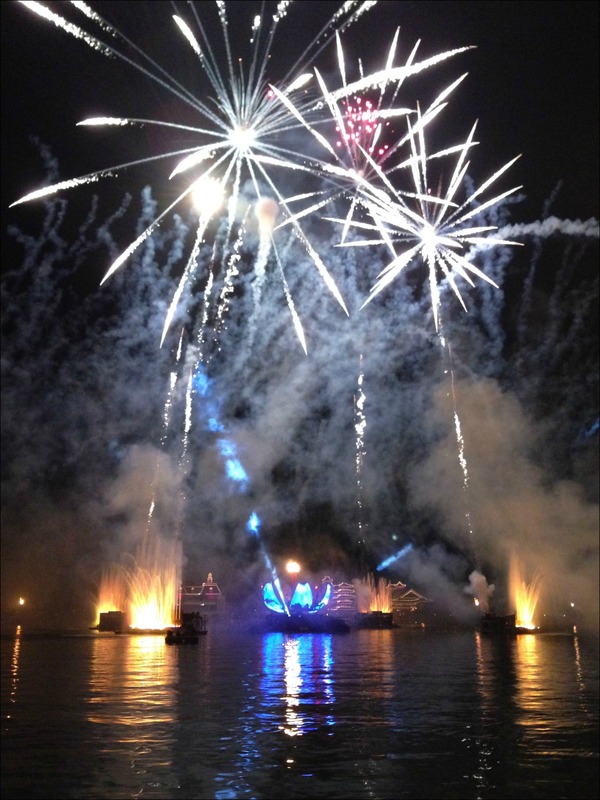 After the presentation was over it was time for my favorite part of the runDisney Meet-Ups, the run! 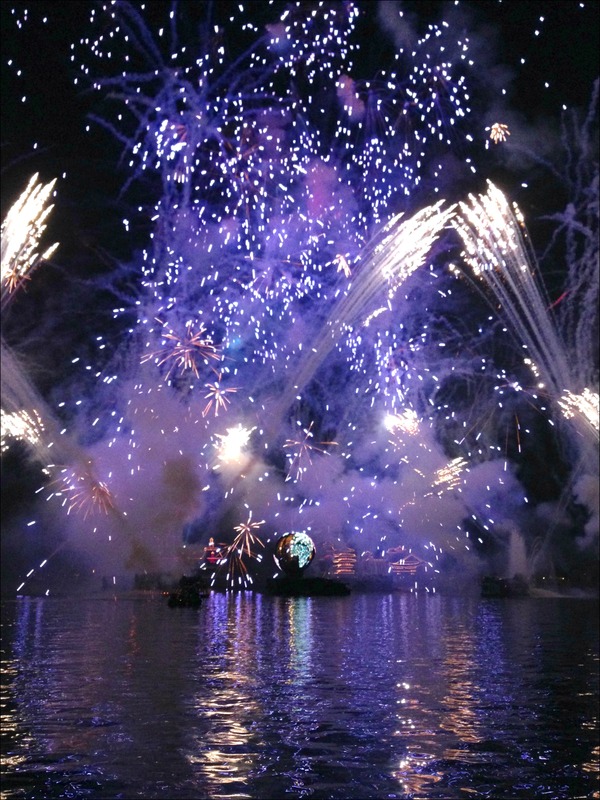 We’d be running around World Showcase one and a half times and then heading towards the front of the park for a champagne toast under Spaceship Earth! 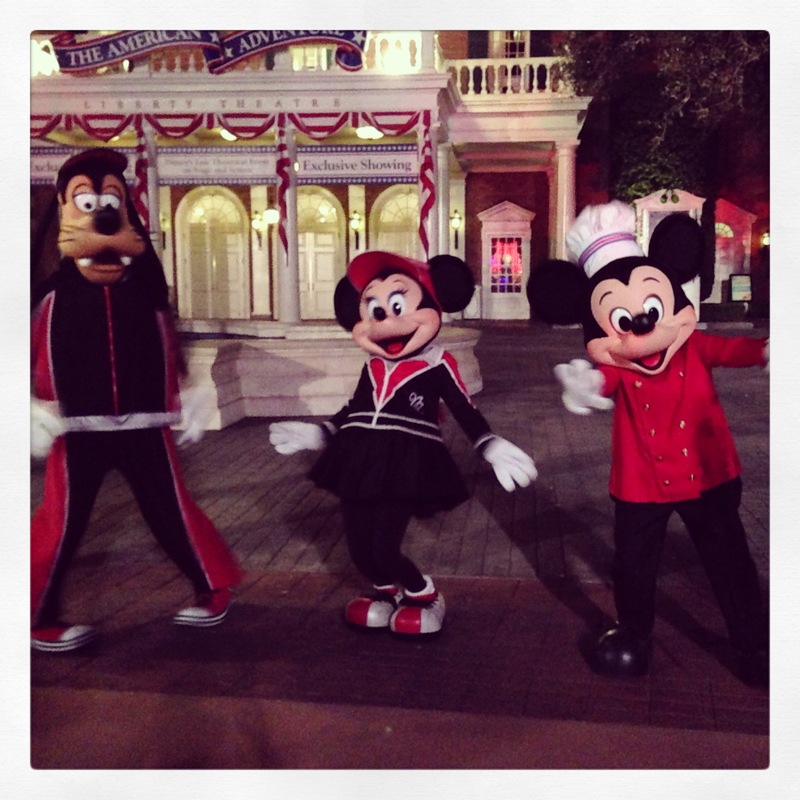 But, while we were waiting to head off on our run these guys decided a little pre-run dance party was in order! I always love meeting new people at the runDisney events, but I have to admit I was especially excited to finally meet Karla from RunKarlaRun! I’ve been reading her blog for awhile and I really enjoyed watching her On the Run coverage of the New York City Marathon, so it was about time we finally met! We got to chat a bit while we ran and she was just as sweet as she comes across on her blog! Funny that we both live in New york, but we had to go all the way to Florida to meet! Hopefully we’ll be able to coordinate getting together in New York sometime! 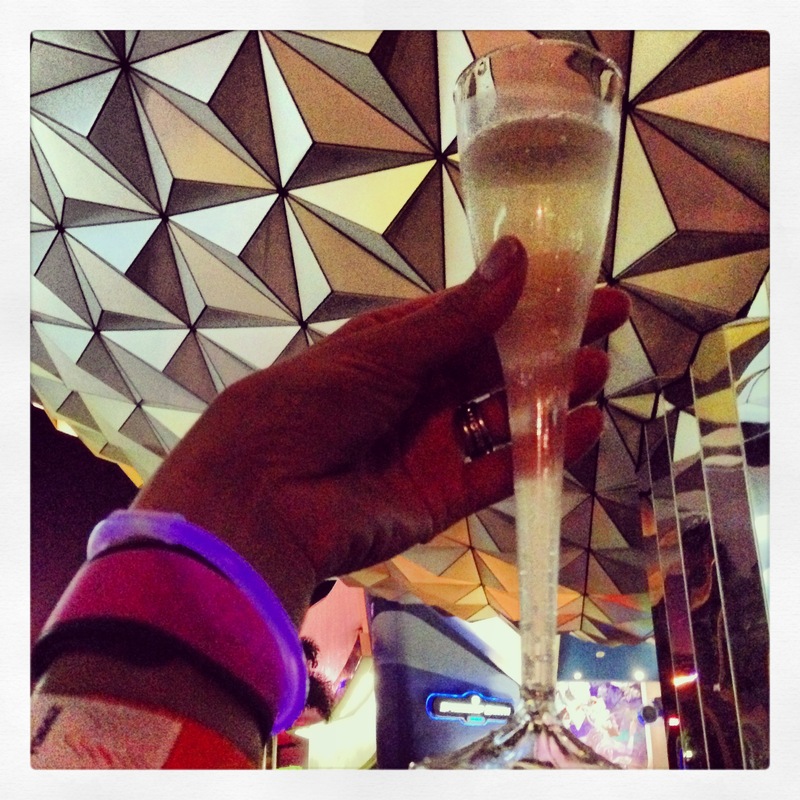 We finished up the night with a champagne toast under Spaceship Earth which was pretty cool when I think about it. I’ve been coming to Epcot since I was a kid and who’d of thought years later I’d be at a private event having a midnight champagne toast! Next up a quick trip to the expo, some park time and then the main event – the Wine & Dine Half Marathon! 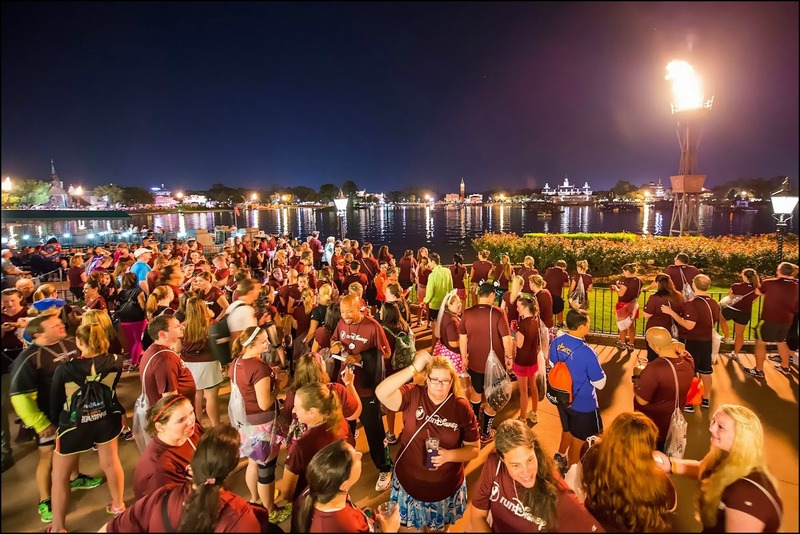 Have you ever participated in a runDisney Meet-Up? If so, what was your favorite part? Great recap Danielle. My favorite part of the meetups is running through an empty park! Me too, it’s such a unique opportunity to be able to run through the parks before they open or after they close! Haha of course! We’ll have to try to plan a meet up run or something like that! Kellie, I was bummed I didn’t get to meet you too. We DEFINITELY need to plan a NY meet-up! Yes! The holidays are so busy, but maybe something right after?! We’ll have to work on something! Hi, I noticed one of your photos said courtesy of runDisney. I thought they did away with that program. They rolled in into another program where you only get discounts if you have a minimum of 20 people booking a minimum of 10 rooms on property. I have members of my running club going to Disney to raise money for Muscular Distrophy, so any money they can save would go to a good cause. think they have 6 people on their team. I’m not sure what program you are referring to so I don’t think I can be of much help. The photos I used that say “courtesy of runDisney” were sent to participants of the meet up after the event for our use, it was just something they did for the private event. OK. 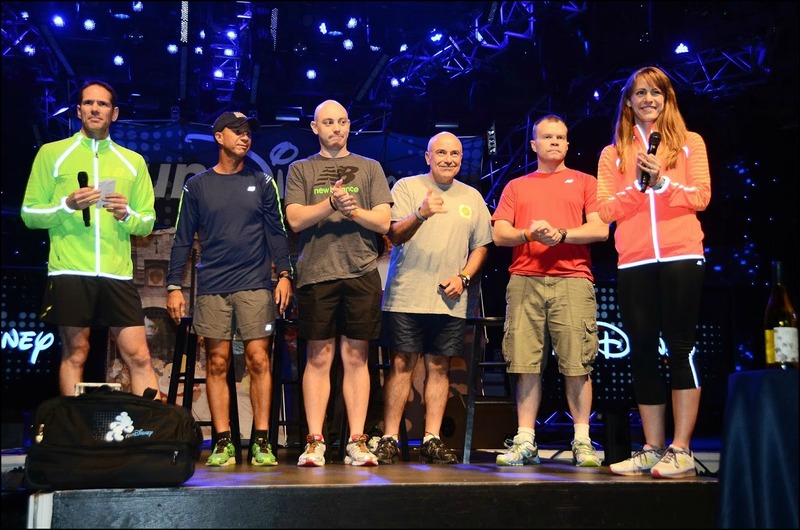 I was working w/ Disney last year for some of my club members who were running Disney races. At one time runDisney offered discounts on packages for runners, but then they changed it. Getting 20 people to Disney for a race is a challenge. They spun it as some new benefit, but it does nothing for the 6 friends who are running for a cause. Looks like lots of fun! Have you done them before? I’m curious which time runners like these best, early morning or late at night. Yes, I’ve done the Wine & Dine Meet-Up in 2011 & 2012 also (W&D seems to be the only one I keep getting in to!). I honestly don’t know which I prefer, I think I like running through the park better in the morning, but having a special viewing area for the fireworks was cool too! Fingers crossed I get into the Princess meet up!!! I love the pic of you and Karla! Great recap. It was so great to finally meet you too!!! I was looking all over the Meet-Up for you and when I saw Jen, I just knew that had to be you with her! I had the same thought–it’s so funny that we ended up meeting in Florida and not NY. We definitely should plan a NY blogger meet-up. It would be so much fun. I love that picture of us. I didn’t even know they were taking it. I was just smiling because I was having so much fun! I know, I was pretty excited when I saw that picture too! I knew Jenn had met you, so she was helping me keep an eye out for you too : ) So glad it worked out! So jealous of that shirt! Looks like so much fun!